I'm really happy today to have Julie Cross on the blog sharing some of the authors who form part of her Bookshelf Requirements. I really love hearing about the books you can't live without, if you'd like to take part in this feature, please do let me know either via comments or email. Julie Cross is the author of the fabulous time-travel YA novel Tempest. 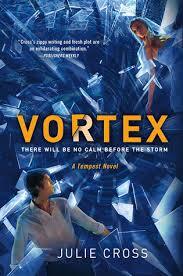 The sequel, Vortex, is published in paperback by Macmillan on the 29th of August. You really must get your hands on a copy of both books, I highly recommend them. I read this series (or at least the ones that we out at the time) shortly after I began my writing journey. I remember very clearly whipping through books 1 and 2 over Thanksgiving Holiday in the fall of 2009. Then before the long weekend was over, I rushed out to Borders (R.I.P. Borders) and bought the third book in the series. In hardcover. At the time my book budget was very tight so was a big splurge. I learned so much about the power of voice in writing, about breaking away from traditional narration and creating a list if that’s what felt natural and made the story flow. Of course I loved the spy school aspect and genius kids, even better that contrast of these girls truly having no idea how to interact with normal kids their age. For instance, boys. Instead of engaging in small talk with a local boy, the four main girls in the book decide the best way to learn about one of their potential love interests is to hack into email accounts, study his garbage looking for clues. It’s like physical proof that no matter who you are and what you’ve learned, we all have to pass through adolescents in almost the same way. That’s like the essence of YA literature in my opinion. It’s the reason you have so many sub-genres in YA and have readers willing shift from contemporary, to sci-fi, to fantasy, to historical. Another thing I love about this series is that is very clean YA with content totally suitable for readers as young as 10 years old. I’m glad all YA isn’t clean like this but when you’re constantly looking for books to recommendto eager young readers, it’s nice to have a good list of titles on hand. When I was a teen, I don’t think YA literature was as well-defined and available like it is now. As an author YA books, I get asked all the time what I read as a teen, what YA book inspired me or influenced me and I’m not sure if reading Lurlene McDaniel’s books led to me becoming a writer. But I read several of her books between the ages of 15 and 17 and I can still recall tiny details from stories (and I’m 33 now). I remember so clearly being on a Greyhound bus when I was 15, traveling between Chicago, Illinois and Dayton, Ohio (about a 6 hour bus ride) and bawling my eyes out reading the end of Don’t Die My Love. I remember wiping my eyes over and over again with my t-shirt and glancing around to make sure no one had noticed the weird teenage girl alone and crying. I read so many books now and rarely re-read like I used to as a kid and teen that it’s easy to forget that feeling a being sucked into a story and living what characters are living and having that leave a mark on you that last for at least 18 more years. This past May, I attended the Romantic Times convention and Lurlene McDaniel was signing books at the fair right across from my table. I’m not one who’s usually bold enough to walk up to authors and tell them how felt reading their book, but I decided this opportunity was too important to miss. So at the end of the event, I went over to get books signed and a minute into our greeting I was spilling the Greyhound bus ride story. Ms. McDaniel spent a good 15 minutes chatting with me. She’s an amazing lady and now I’m even more determined to write characters that leave a lasting impression on my 15 year old readers out there. I picked up this copy of Forever at a used book store last summer. It’s the original cover which is really cool in my opinion. I don’t have a ton to say about Judy Blume that thousands of readers and writers haven’t said before, but basically her and Margaret taught me everything I needed to know about puberty and then Kath and Michael taught me that relationships and love can still hold important value even if they aren’t forever. Meeting Judy Blume someday is at the top of my author bucket list. Thank you, Julie! 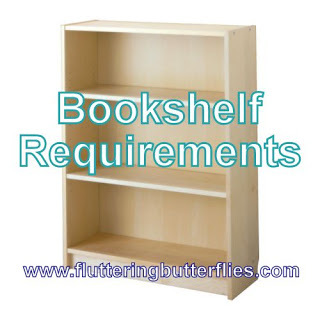 Which books would make your list of Bookshelf Requirements? I've only read the first two GG books so I must catch up with the series :) And Heist Society! The whole spy thing is awesome. Great choices. The GG books just get better and better so yeah, keep reading! I've read and loved the first book in the Gallagher Girls series and loved it. I seriously need to catch up... And oh, Judy Blume. I've only read Forever but it shaped by early teen years.